Just waiting for the release to be signed. 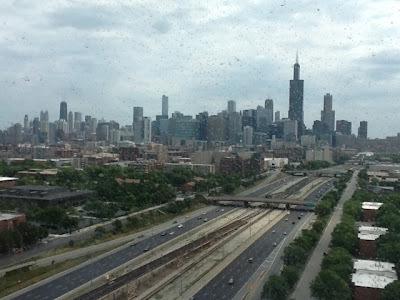 How about one more view from the 12th floor of Rush hospital? Dirty windows and all. I give you the Chicago skyline. That is the Eisenhower expressway at the bottom of the pic. Sears Tower in the middle. No - not the Willis. Sears Tower. And to the left is the John Hancock building. You can see US Cellular from where I am sitting right now, but I can snap a decent pic. Sue me!! !